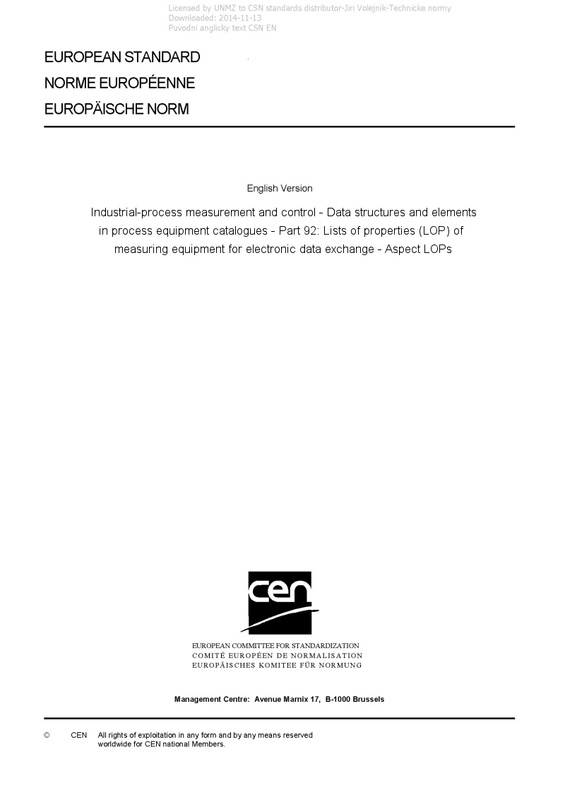 EN IEC 61987-92 Industrial-process measurement and control - Data structures and elements in process equipment catalogues - Part 92: Lists of properties (LOP) of measuring equipment for electronic data exchange - Aspect LOPs - IEC 61987-92:2018 provides the lists of properties (LOPs) describing aspects of equipment for industrial-process automation that is subject to IEC 61987 standard series. This standard series proposes a method for standardization which will help both suppliers and users of measuring equipment to optimize workflows both within their own companies and in their exchanges with other companies. IEC 61987-92 contains additional aspects that are common to all devices, for example, “Packaging and transportation”, “Calibration and test results” and “Device documents supplied”. The structures of the LOPs correspond to the general structures defined in IEC 61987-11 and agree with the fundamentals for the construction of LOPs defined in IEC 61987-10. Libraries of properties and of blocks used in the aspect LOPs are listed in Annex B and Annex C.